1986 STAR WARS #107 CGC GRADED 9.8 SS SIGNED BY CARRIE FISHER (ULTRA RARE) MINT! 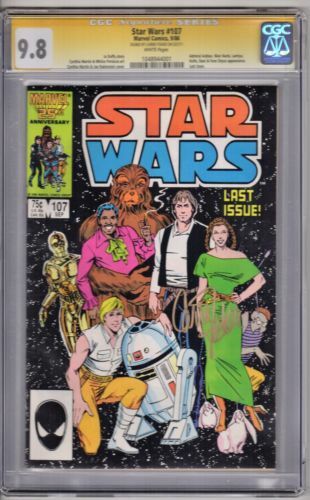 YOU ARE BIDDING ON A 1986 MARVEL COMICS STAR WARS #107 (LAST ISSUE) CGC GRADED 9.8 SIGNATURE SERIES SIGNED BY CARRIE FISHER (PRINCESS LEIA)! ULTRA RARE! THIS AMAZING BOOK IS CGC GRADED 9.8 SIGNATURE SERIES (SS)! THIS COMIC BOOK IS THE LAST ISSUE OF ORIGINAL STAR WARS RUN FROM MARVEL COMICS. THIS BOOK FEATURES THE SIGNATURE OF CARRIE FISHER (PRINCESS LEIA)! THE CGC NUMBER ON THIS BOOK IS 1048944001. THIS ULTRA RARE ITEM IS IN HAND AND READY TO SHIP. THIS CGC GRADED COMIC BOOK WILL BE IN MINT CONDITION, AND WILL SHIP WELL PROTECTED. THIS ITEM WILL BE A GREAT ADDITION TO YOUR COLLECTION! I AM A TOP RATED PLUS SELLER AND MY SELLER RATING IS 100%, SO PLEASE BID WITH CONFIDENCE! SINCE I HAVE HAD THEM THE ITEMS HAVE BEEN STORED IN A SMOKE FREE, LIGHT FREE LOCATION. THIS ITEM IS AN AMAZING PIECE FOR ANY STAR WARS COLLECTOR AND IS A GREAT INVESTMENT OPPORTUNITY! Our prefered method of payment is via paypal. Your item will ship as soon as payment is made. Thank You for your interest and happy ebaying! We always ship EXPEDITED MAIL, so you can expect your item 2-3 business days after you pay for it! When shipping your item we always use the best packing materials available to keep your item in “fresh from the case” condition! We will NEVER ship you an action figure or a comic in a paper envelope or a padded mailer. Regardless of an items value it will always come to you in a box and well protected! WE OFFER COMBINED SHIPPING FOR MULTIPLE ITEMS PURCHASED! For your convenience we always have worldwide shipping available! We will give FULL RETURNS within 14 days of delivery confirmation on new, unopened, and factory sealed items ONLY. (Please contact us to receive authorization) The item must be in the same condition that it was sent to you in. Returns will be shipping in the buyer's responsibility. We DO NOT offer returns on paper items, open items, loose items, or itemsthat were sold open or without packaging as it is not possible to verify original condition. Please feel free to contact us any time. We look forward to answering your questions and providing you some of the the best service on ebay!